Reports are coming in that at least 58 people are dead in what witnesses call a chemical weapons strike in northern Syria. Doctors in the rebel-held town of Idlib are reporting that victims have started to choke, vomit and faint with foam coming out of their mouths. The UK-based Syrian Observatory for Human Rights says that, so far, 11 of the victims are children, and cautioned that the death toll could rise. 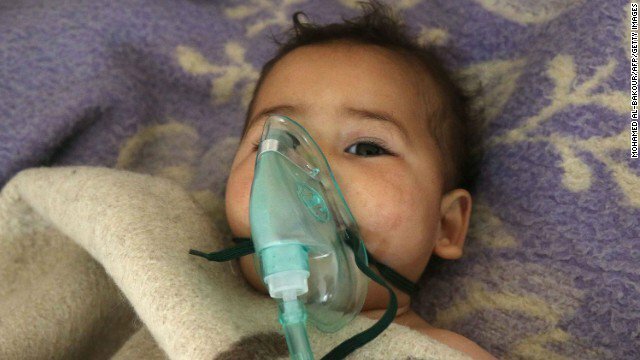 Dr. Shajul Islam tweeted pictures of the patients, saying he believed they were victims of sarin gas and asking “Will anyone care? Who will stop it?” Pictures were also posted of rescuers spraying victims with hoses, in a desperate gamble to save their lives. You can see some of the images here, but be warned, they are graphic and disturbing.